LAS VEGAS, NEVADA (PRWEB) NOVEMBER 30, 2015 — Just in time for the holidays, the Smart # Hashtag is here. Brands can now take advantage of the new smart hashtag technology, powered by Social Media Gateways, Inc. and SSNAPP, to discover, engage and recognize customers and employees this holiday season. By utilizing smart hashtag marketing, brands now have a faster and seamless way to leverage user-generated content in order to create enduring engagement with their customers — all within a simple dashboard. This, combined with SSNAPP’s gamification and marketing automation, allows brands to identify their loyal customers and capitalize on their engagement in real-time by automating rewards, offers, discounts and acknowledgements for their social achievements online. As part of their everyday life, social media users are currently generating massive amounts of content on social mediums. Brands are part of this user-generated content (UGC) by default. 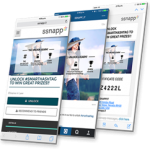 With SSNAPP’s Smart # Hashtag, brands are now able to effectively integrate with this content without changing the user’s existing behavior. Take for example, the restaurant Hash House A Go Go in Las Vegas. Hash House A Go Go is capitalizing on user-generated content by asking their customers to post a photo of their meal to their social media accounts with the hashtag #HashHouseAGoGo for a chance to win free meals and weekly prizes. The restaurant is able to go beyond purely raising brand awareness to actually getting actionable information beyond how many people saw their brand or ad. View the campaign here. And to celebrate the release of the Smart # Hashtag this holiday season, SSNAPP is giving back to the community through the #FeedAFriend Campaign, while also providing brands with the opportunity to run free Smart # Hashtag campaigns to show customers their appreciation.